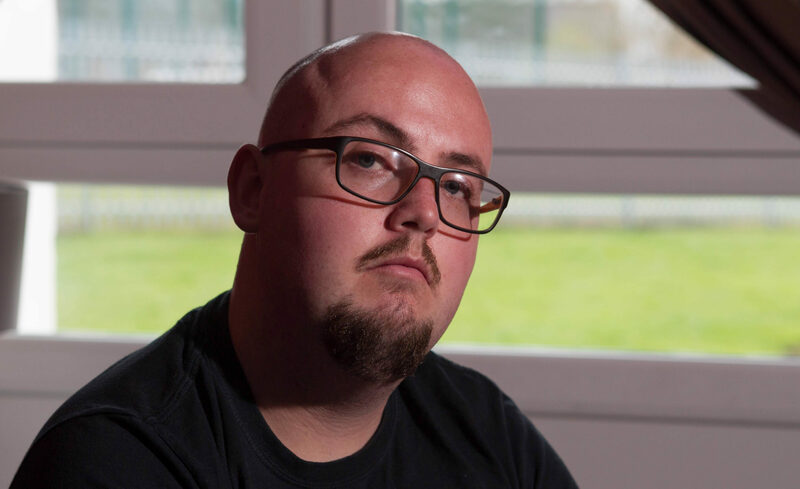 A YOUNG man with multiple sclerosis has told of his shock after being accused of lying about his condition and ordered to hand back almost £20,000 of benefits. Michael Forsyth was diagnosed with the debilitating condition just a week before his 21st birthday and started claiming the Personal Independence Payments, which replaced the Disability Living Allowance. But he has now been ordered to pay the money back after he was covertly followed by a surveillance team from the Fraud and Error Service. His mobility car was also taken away last week and Michael, 26, says he now suffers regular panic attacks and is paranoid about going outdoors for fear of being spied on. Medication for his anxiety and depression has been doubled as a result and the stress has worsened the symptoms of his MS. He says when he was evaluated for PIP in March 2015 his MS was particularly bad and he was in a wheelchair during the assessment. But last June the surveillance team recorded Michael regularly walking his dog without any type of aid, exercising and cleaning his car. They also looked through his Facebook history and saw pictures of him at T in the Park, on the pitch at a charity football match and building a cabinet. 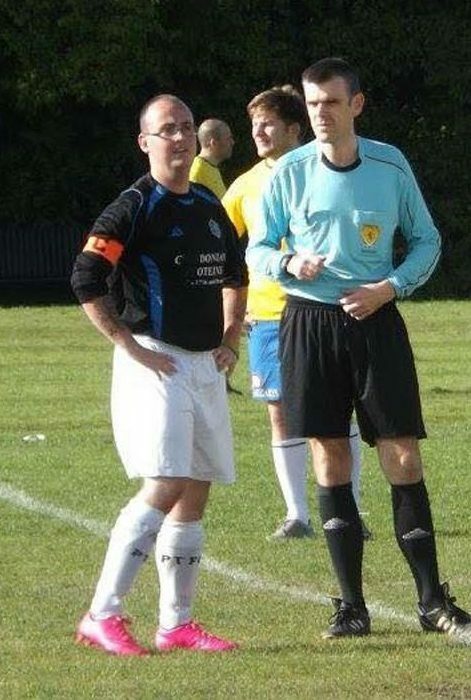 But Michael says he was with the MS Society, which he had joined to help raise awareness, at the music festival and at the football match, when, he says, he only kicked the ball a few times. He said: “And yes, I did clean my car but what they didn’t see was me having to go to bed for hours afterwards because I was exhausted. He has been to his GP surgery 38 times in the last year for a variety of complaints related to his MS such as fainting, depression, tonsillitis, migraines, insomnia and falls. Because his PIP has been stopped, Michael’s Employment and Support Allowance has also been affected and he has also been ordered to pay back £1,436.35, which will be taken from his weekly payment of £125.55 for the next four years. Although he has yet to be told how he is expected to pay back the £17,881.82 PIP sum, he expects it will also be taken from his weekly ESA. The Department for Work and Pensions have shared their findings from the surveillance operation, including the revised scores for the 12 activities used to determine whether someone should get PIP and how much. Activities include eating and drinking, washing, going to the toilet, communicating and getting around. Michael’s revised scores, based on the evidence gathered, were zero for all 12 activities. He has now appealed the decision. But the response from the DWP insisted this was just an “opinion” and didn’t give the full picture. According to the DWP, nearly 3.1 million PIP decisions have been made, and of these 9% have been appealed and 4% have been overturned. “Once again, we have a case highlighting how the current welfare system doesn’t work for people living with MS.
“The fluctuating nature of MS means current benefits assessments aren’t suitable. 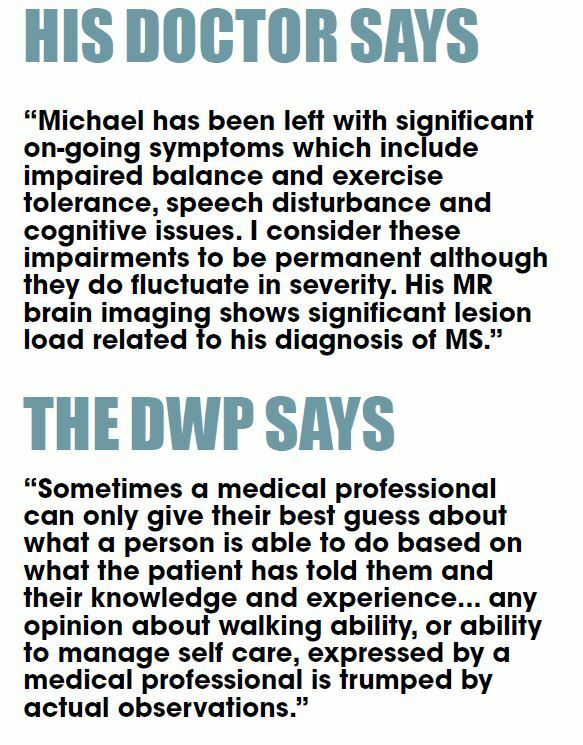 “MS is a lifelong condition with a range of hidden and unpredictable symptoms – something the current benefit system seems incapable of understanding. “Since the introduction of PIP, one in three people with MS on the highest disability benefit have seen their award reduced after reassessment. “The UK Government urgently needs to fix this broken system. “Having MS is hard enough. PIP benefits have been dogged by controversy for five years. A survey by the Disability Benefits Consortium found 79% of respondents said assessments had made their health worse, due to stress. Although parts of the benefits system is being devolved, it is thought it may be 2021 before the Scottish Government is in full control. Scotland has one of the highest rates of MS in the world, with more than 11,000 people living with it in the country. MS stays with you for life, but treatments can help manage the condition and its symptoms. MS affects almost three times as many women as men.